I definitely will go for a pie crust topping! This looks utterly delicious and extremely tempting. Thanks, Angie! And I look forward to checking out *your* latest tempting dishes this weekend. It had to happen. Peaches and pecans. Piecrust vs cake or biscuit. Double crust vs truncated version. The perfect storm. Check, check, check! Ya got me. Congrats to you and your genetics for making all the right decisions. 5 CLEAVERS! Oh, Sully, it's always such an honor to receive the coveted 5 Cleavers award! It's like that old cereal commercial: "Mikey liked it!" 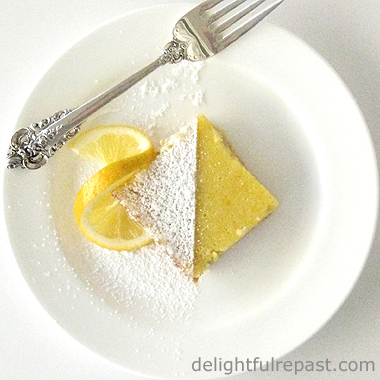 Okay Jean, my favorite almost anything is peach (or lemon in the springtime), but this recipe is now my new favorite. And I just got an email from our local farmers market that sc peaches are ready. Yum!! Ohhh, Judy, that is so nice to hear! Thank you! I didn't actually realize a cobbler could have a pie-style topping and still be a cobbler, but then again, I would probably try to call something like this a "crumble" in which case the topping sort of needs to be more crumb like. As always, the photo looks absolutely delicious. Hello Jean, Peaches have been wonderful this year, and I've been eating them almost daily. Your recipe sounds great! Pauline, thank you! And I love to make crumbles, too! Thanks, Carol! I've been eating them just about every day, too! On days it was too hot to bake, I blended them in smoothies or just cut them up and ate them fresh. That looks amazing! It is funny how everyone has a different idea about what makes a cobbler vs. crisp vs. buckle etc. I say whatever grandma did must be right! Carlee, thank you! And, as far as I was concerned, my grandmothers were always right. I adored them both, one Southern, one English -- so different, but they always had a great time together, often in the kitchen! Your grandmother and mine must have learned how to make cobbler together! The first time I saw cobbler with a 'biscuity' crust I was amazed. Hi Jean. I hope you have had a good Summer? I like the sound of Peach Cobbler, just a little unsure about the word ,easy , in the title though. " Cobblers," a good Anglo Saxon word, there,Jean!!! Ha! Ha! Just noticed, Pauline's comment. My mother used to make apple crumbles. Amy, thanks! I agree. Have always preferred any kind of fruit dessert over something chocolate, for example. Pie crusting sounds better and who am I not to go with your grandmother..
Jacqueline, smart woman, your grandmother! It's always interesting to me to look at a family's food traditions. Tony, I'm not a fan of summer (too hot, too bright), but life is good! And, I must say, British slang is much more amusing than American! Jeanne, I'm going to for sure try this pie crust. Looks wonderful. Linda, thank you! Let me know how it turns out for you! Greg, I hope you guys are having a great time on your travels! Happy trails! My darling son-in-law loves peach pie. This looks like a recipe I could follow to make him a special treat! Mo, thank you! I hope he likes it! Mimi, thank you! I hope you and your readers will enjoy it. Yummmm, Jean! I have the freestone peaches and I'm making it tonight! Sue, I hope you like it as much as we do! Thanks so much, Stephanie! I loved reading about your Grandma Betty! I'm in line with your thinking, Jean. I like my cobbler (fresh in-season fruit is my fav)with a more crusty cobble. Your grandmother's way of doubling it up doubles the fun. I've bookmarked this for I'll be trying your pastry soon. Cheers! Peach Cobbler Report: This was as good tasting as it looked in your photo! I added the 1/2 cup ground pecans to the pastry. I have a confession to make...this was my first crust I ever made with butter. I've always found it so easy to do an oil based crust. But I have to say this was easy and delicious. Thanks, Jean! Brooks, thank you! I'm looking forward to fall -- better baking weather! Sue, thanks for the report! I'm so glad you tried it ... and liked it. Don't the pecans go well with the peaches? Mimi, that makes me soooo happy! You just made my day. Hope you have a great week. Tandy, unlike a lot of cooks in the US, I do a lot of weighing. Especially when I'm posting it to the blog, because I have lots of readers from other countries. Mmmm.. Love this! Anything with Peaches and Pie Crust has my name all over it! Serena, thanks! That's just how I feel! Love this Peach pie, when I get chance to buy them I will try to make it. thanks for sharing with Hearth and soul blog hop. pinning and featuring on this week's blog hop. Swathi, you are the best! Sometime when I get more peaches, I'd like to try a peach and ginger chutney. Melissa, thank you so much! I'm so glad it was a hit! 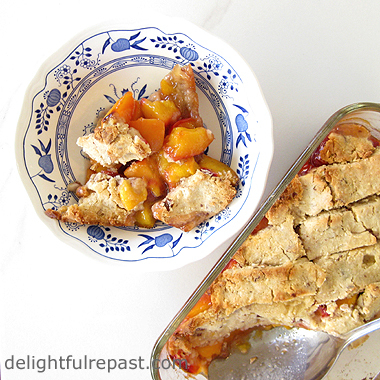 What a delicious peach cobbler, Jean, and I love the no roll pie crust! Thanks, April! It does simplify matters! Yum!I haven't had peach cobbler for so long. I'm always intimidated by making the crust. Your no roll pie crust has sold me. I'm going to give it a try. Thanks! Dori, that's wonderful! Let me know how it turns out for you!